Welcome to the VITTELLO online sofas store where every month you will find a promotional product at an incredible price. In addition, you can configure your VITTELLO sofa adapted to your tastes and needs, being able to choose between different materials and colours, and even adding some extras such as a sound system or relax motor. Also in the online purchase of your sofa you will have our free transport and assembly service so you do not have to worry about anything, just enjoy. Why purchase a VITTELLO sofa online? The sofa is the star piece of our living room and one of the furniture of the house that we use the most: Spaniards spend 10 years of their life sitting on a sofa. Therefore, buying your sofa should be a very thoughtful decision and you should look for a provider that gives you trust, quality and design. 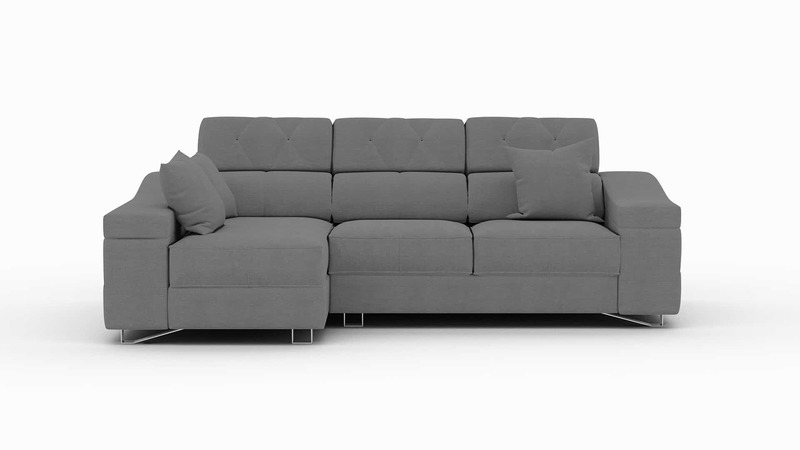 Buying a sofa online has many advantages, and even more so if it is a VITTELLO sofa. Take advantage of our unique monthly offer! The first reason to buy a sofa online is the convenience of buying at home: always look for the security and guarantee of a consolidated company and physical stores. Our online store is available 24 hours a day, 365 days a year, and all our sofas have free shipping and assembly. At Vittello you can make your purchase safely with your credit card. You can also finance your purchase in 12 months with no interest, complying with all the standard security protocols for this type of payment. Currently there are payment systems such as cards, which offer us security, data confidentiality and security. At Vittello we also give you the possibility to pay in instalments the amount of the product that has been acquired on the website or in our physical stores, without opening fees or interest. You only have to send us your ID and contact number to our email: info@vittello.com or call us at 952 369 077 and one of our advisors will inform you to complete the financing process. One of the advantages that we offer at VITTELLO is the price, which will be unique during a month for purchases made online. You can buy your outlet sofa with discounts of up to 50% off from the comfort of your home and finance it up to 12 months without interest. You can also choose the type of upholstery, leather, fabric or magic fabrics in different colours to give your sofa a unique personality, a sofa that adapts to you. You can also add the extras we have available to provide more functionality to the sofa as they are sound system, relax motor, beverage cooler … you will not miss out any details for your sofa! If you have a special need when buying your sofa, contact us. You can call us, write us an email or simply visit us in one of our 13 sofas and lounge chairs store distributed throughout the national territory. You can find us in Malaga, Marbella, Valencia, Madrid, Oviedo, Gijón and Barcelona. We will be happy to advise you! Our CAROLINA model has been designed for lovers of elegance. It is an Italian designer sofa in which straight lines are mixed with a traditional style, thus combining design and comfort, one of the main features of VITTELLO. It has integrated a system of sliding seats and folding backs, which gives us the possibility to lie down and relax when we get home, as well as kidney rest cushioning with Soft fillers.